County Armagh kicked off the SuperCupNI tournament with a 2-0 defeat to USA-based Strikers at The Warren on Monday afternoon. 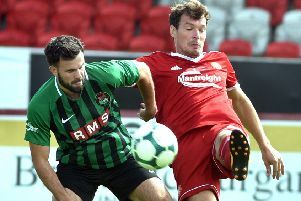 The reverse in Portstewart left manager Brendan Grimes frustrated at the lack of reward for what he considered full commitment from the Orchard County boys. “You could not fault the effort put in by the players, it was 100 per cent,” said Grimes following the final whistle. “We were probably disappointed with the manner of the goals we conceded. “I would not want to put it down to a sluggish start in our first match as we worked hard during the preparations, although it all comes down to what happens on the day. “We will regroup now and look to Tuesday’s game. COUNTY ARMAGH (PREMIER): Liam Hughes (Dungannon Swifts), Daniel McKeown (Glenavon), Lee Upton (Portadown), Sean Toman (Dungannon Swifts), Daniel Neill (Portadown), Luke Wilson (Portadown), Oisin Smyth (Dungannon Swifts), Cahal McGinty (Dungannon Swifts), Pablo Andrade (Linfield), Ryan Carmichael (Portadown), Andy McAlinden (Lurgan Celtic). Subs (used): Ryan Leeman (Loughgall), Tom Weir (Portadown), Ryan Latifi (Portadown).